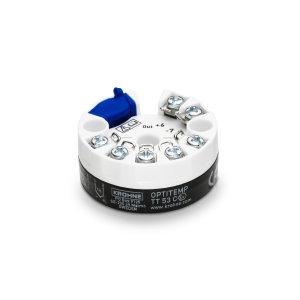 The OPTITEMP TT 53 R is a universal, programmable, 2-wire rail-mounted temperature transmitter. The galvanically isolated transmitter works with RTD elements, thermocouple (TC) elements or other inputs (mV and Ω). It supports wireless Near Field Communication (NFC) as well as Bluetooth® communication. 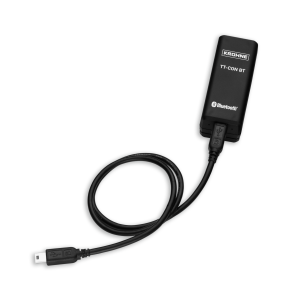 The OPTITEMP TT 53 R transmitter can thus be remotely configured and monitored using mobile devices. 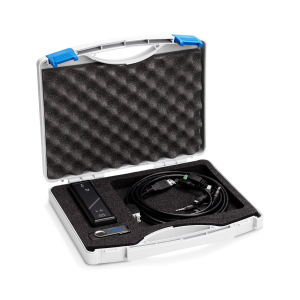 Featuring HART®7 communication, the transmitter also offers extended diagnostic information (for example device error, sensor and wiring conditions). In addition, it is able to measure the actual supply voltage as well as the ambient temperature while making them available via HART®. The maximum values are stored internally. The robust design of the OPTITEMP TT 53 R makes the transmitter highly reliable even under harsh environmental conditions. It is available for use in hazardous areas. The temperature transmitter is designed to be mounted on a DIN rail. 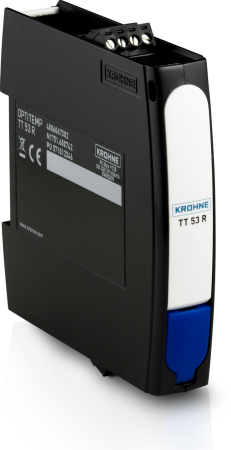 A dedicated head-mounted version is available with the OPTITEMP TT 53 C.
Enhanced diagnostics (NAMUR NE 107), incl. sensor break monitoring, error correction etc.